Forget all rituals and symbolisms associated with Ganesh Chaturthi. 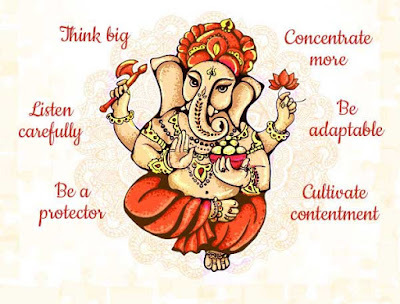 What is Ganesha to us? When we stand with our eyes closed before Ganpati – He is the only hope, the only way to happiness, the only way to success, only way to bliss and only way to Moksha and self-realization. The unimaginable, the indefinable, Supreme Truth takes a form and arrives at the home of his devotees. His arrival brings positive optimism. He instills confidence in us to face daily challenges. He makes us realize that all that was here, is here and will be here is Him. Not even a single atom moves without his knowledge. Those who want worldly success He blesses them with that. Those who want self-realization; He removes all obstacles and guides them in the path of Moksha. It is for us to decide what we want eternal bliss or perishable joy. With this annual arrival, Ganesha breaks the man-made distance between man and God. He arrives to teach us equality and peaceful coexistence and above all coexistence of human beings with Mother Nature. After satisfying us by staying amidst us, Ganesha returns to his formless nature. Why one should not look on Moon on Ganesh Chaturthi?